Cats are small creatures. They’re nimble, agile, and quick. They also get sick easily. While nine lives can come in useful, your furry friend doesn’t want to live one of them in pain. So it’s important to keep an eye out for signs and symptoms of common issues in cats. Some of the most important issues your cat faces are urinary track health, IBS, diabetes, and hyperthyroidism. The most frequent of these ills is hyperthyroidism (although diabetes is a close second). This ailment is especially common in cats over the age of ten. If you are looking for more general information, you can check out the best cat food guide we made for you. Hyperthyroidism is a common endocrine disorder. It’s frequently seen in older cats. Hyperthyroidism is the result of the body overproducing thyroid hormones due to a tumor in the thyroid gland. In the vast majority of cases (around 97%), this tumor is not cancerous. Once the elevated levels of thyroid hormones reach a cat’s body – their metabolic rate increases. This puts undue pressure on the heart, liver, kidney, nervous system, and other organs. Every single organ in your cat’s body is under extra stress due to the increased metabolism. Hyperthyroidism can start small in cats. Sometimes it can be hard to notice in our furry friends. You’ll want to monitor your cat’s eating habits as he or she ages to ensure hyperthyroidism doesn’t harm your cat. Untreated this ailment can be fatal. If you notice your cat showing signs of hyperthyroidism, you must take him or her to the vet immediately. It’s important to get a proper diagnosis before making any dietary changes. Once you’re certain your cat has hyperthyroidism, you’ll need to make proper dietary changes to ensure he or she manages the disease and gets healthy. 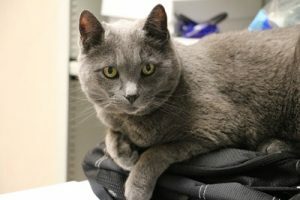 The most significant changes a cat owner can make are increasing the iodine in your cat’s diet. Iodine deficiency has been directly linked to hyperthyroidism. Without proper iodine levels, your cat will struggle to stay healthy. Another important dietary change for cats with hyperthyroidism is switching from dry food to canned wet food. Cats must have a diet that they receive their water from food sources. Most dry food does not do this. Canned wet food always will. This will increase the overall health of your cat, and ensure hyperthyroidism stays away. There are not many good cat foods out on the market that directly address hyperthyroidism and do not require a prescription. Through testing, we only found one brand that offers a proper cat food for hyperthyroidism. If you notice hyperthyroidism in your cat, you’ll want to immediately switch to this cat food. 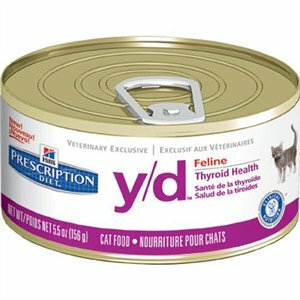 Hill’s Diet y/d Feline Thyroid Health Canned Cat Food is the absolute best in combating your cat’s ailment. Three weeks of this canned cat food should suffice for getting your cat’s thyroid function back in line. Always see a vet before implementing any dietary changes designed to cure of your feline of a disease. 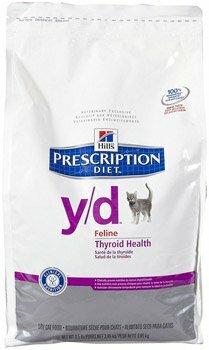 Hill’s Diet y/d Feline Thyroid Health Dry Cat Food is another great option for cats with hyperthyroidism. However, you’ll need to begin feeding your cat this formula after the initial three-week period. This food is excellent for cats with an overactive thyroid, but the canned food is better and will offer faster results.